If you are anything like me, you have looked at observation hives, and scratched your head thinking.. How the heck do you manage something like that? To keep the bees from swarming, because of the small size and few frames. Or even just keep it clean? Added to that, most observation hives are set up for indoor use, so you have to unhook them and remove them from the house in order to do maintenance, treat or clean. 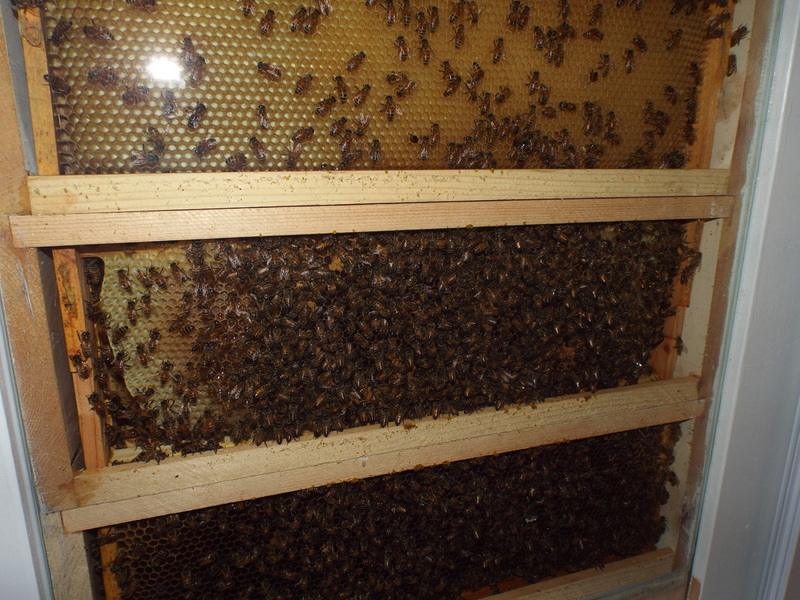 My first difficulty is that observation hives have few frames, giving the bees little room to grow. Most observation hives I have seen use deep frames. I only use medium frames. I set the wheels in motion while relaxing in the sun last weekend, staring at the front of the house, and in particular, a broken window. This window is a year and a half old, and it decided to break during one of last winters storms when it was 40 below.. The INSIDE pane just cracked in a half circle, from one locking latch to the top corner.. Warranty was done at one year, so its my baby.. what am I going to do with it? I mentioned to my wife... Now would be a perfect time to replace that window with an observation hive! I said it, expecting her to laugh.. Much to my surprise, and delight.. she said.. I would like that, as long as they are OUTSIDE the window.. So I started looking the window over. It cranks open and closed. The crank I am not interested in, but the locking system I am. 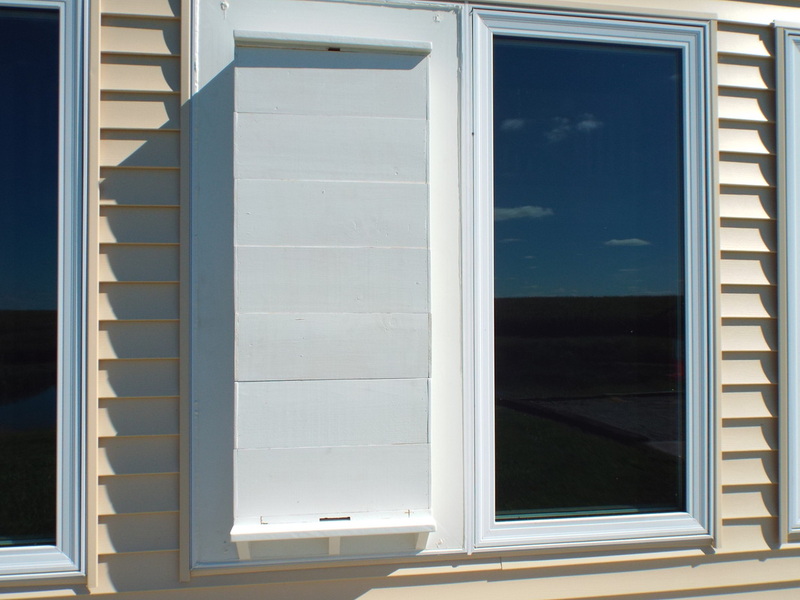 It has two tabs on one side the window cranks over into/under. On the other side it has a sliding latch with three pins. The window frame itself has the clips that these pins slide into when the window is latched.. It took about thirty seconds for me to realize I could use the clips to securely lock my "new" observation hive frame into the casing. I built the frame and painted it, then made sure it would slide perfectly into the casing. The picture below is what I came up with. It has a single box sitting on the bottom board. I will take the frame up and have glass cut for it this week. 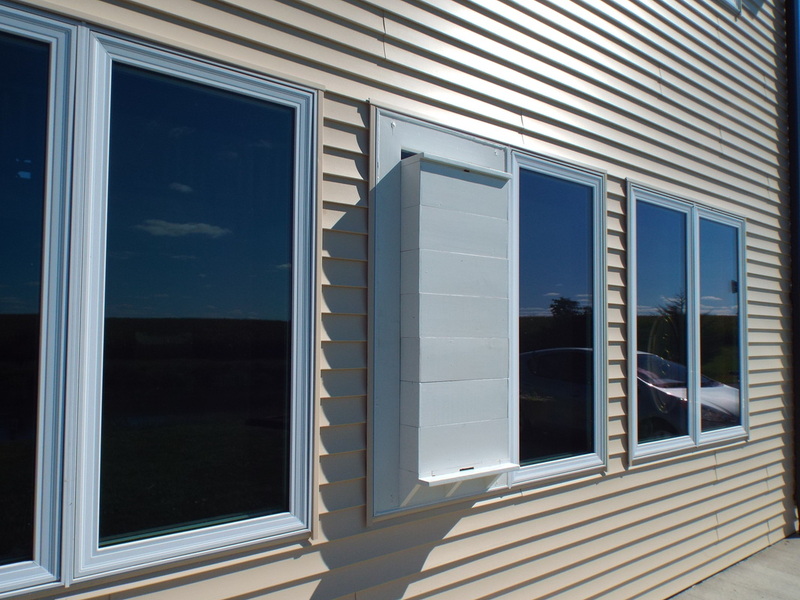 The brood boxes are simply medium boxes narrowed to accept three frames. Seven boxes will fit in this window, allowing me to have 21 frames. The rear of these boxes is open, with two supports. They will slide back against the glass so they can be viewed from inside the house. 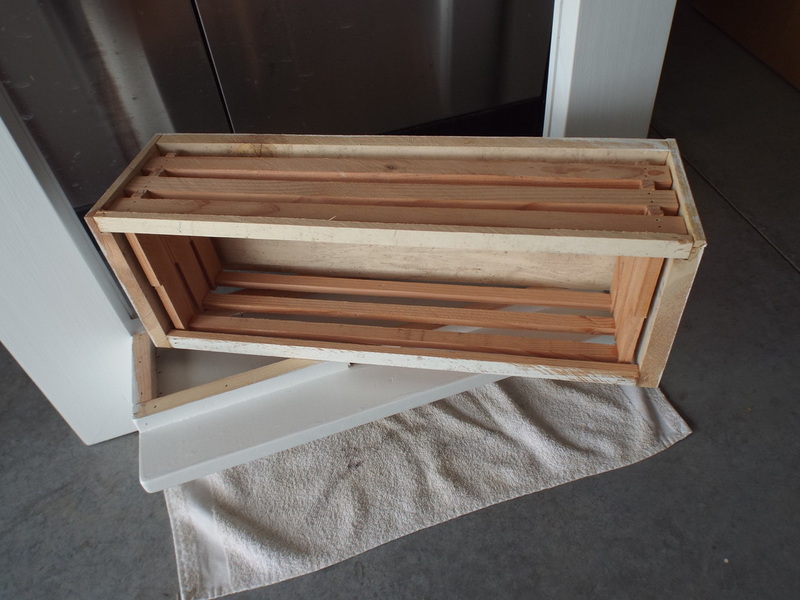 I will simply add boxes/frames as needed, JUST as you would do on any standard langstroth hive as they grow. This set up keeps them outside. It allows the same level of manipulation any standard hive does, allowing me to remove brood, treat, and clean the glass at every inspection. The downside? You cant see between the frames. You will have view of only one frame, and some view between the frames where the boxes come together. I will be able to watch them fill the foundation-less frames. When they have them all filled, it will be time to give them two or three empties so we can watch them fill those. The boxes will be recessed back into the frame, coming to a stop against the pane of glass, so they should be secure, even in a storm. Inside the house, the screen will be removed, and I will cut a piece of 1/4 inch luan or plywood to replace the screen. 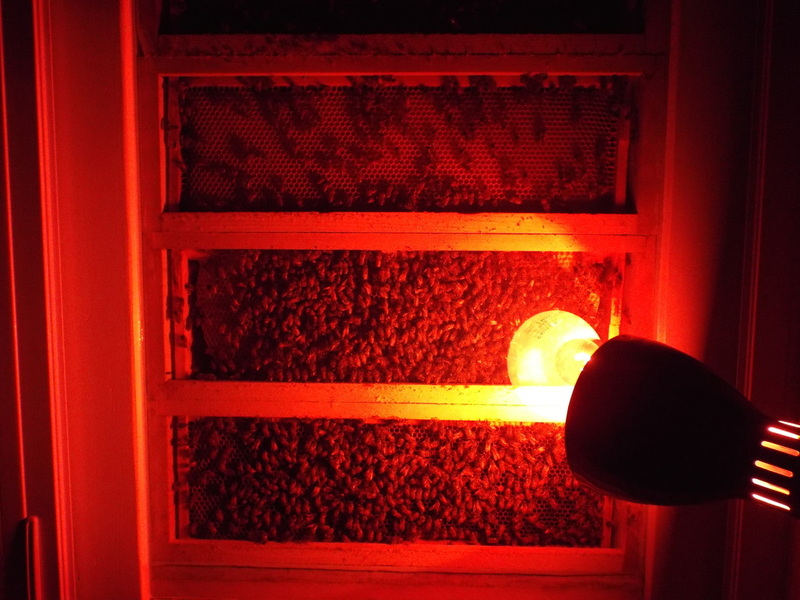 This way I can close up the hive, meaning give them darkness when we are not watching them. I am hoping that some heat will leak through the luan and single pane of glass to help them overwinter, without being too much warmth. In mid summer when it is 100 degrees out, the house will be air conditioned.. with luck, helping them regulate temps in the hive, rather than hindering them. It all remains to be seen and experienced. Glass installed and time to test fit! So there it is in all of its installed Glory. Seven boxes, each capable of holding three frames, for a total of 21. There is enough room left at the top for a piece of foam for insulating the top during winter. I have high hopes they will be as capable of wintering in this set up as they would a hive in a house wall. About the 8th picture in is a pic of my home grown American Tiger Queen, Fat and sassy she is laying well. Since these pictures were taken, I have added another small hive to this one. Six frames of bees were added to the top with a newspaper combine. The queen in the small hive that was NOT building up was axed, the following day the newspaper combine with six frames was done. I shook bees from 4 frames into those six, and all of the rest of the bees were shaken out about 15 feet in front of this hive. The combine went well. I will give them a few more days before I remove the paper. I removed the panel that blocks the hive off last night, pulled my chair up and set my rum and coke on the window sill and watched them.. The queen made an appearance.. A LONG appearance, wandering across the frame, her tail usually within a cell laying eggs. No sooner would she remove it than it was in the next cell. I enjoyed the show so much I had to go refill my drink! Now to get them fed up and prepared for the long cold winter. It is now 2016, and the OB Hive is as much a hit with visitors as it is to me. The bees thrive in this hive, and have survived the winters exceptionally well... because of the heat from the house? I do not know, but suspect that warmth helps them, as I do not wrap or even insulate the OB hive in any way. I simply make sure they have plenty of honey reserves above them as winter approaches... it helps that I can peek all winter to see how they are doing on stores. The OB Hive this spring is BOOMING, and will have to be split very soon, like, in the next week.. I will be making queens in a couple days, this hive will provide enough frames of brood and bees for two, possibly even three nucs. I will give them some new foundation-less frames, so I can watch them draw the wax. At this point, I have no complaints about how this hive is set up and works... OK, maybe one, I have to use a ladder to get the top couple boxes off, otherwise, it is as easy, or a little easier than managing a standard nuc. Awesome addition to the house for ANY beekeeper!